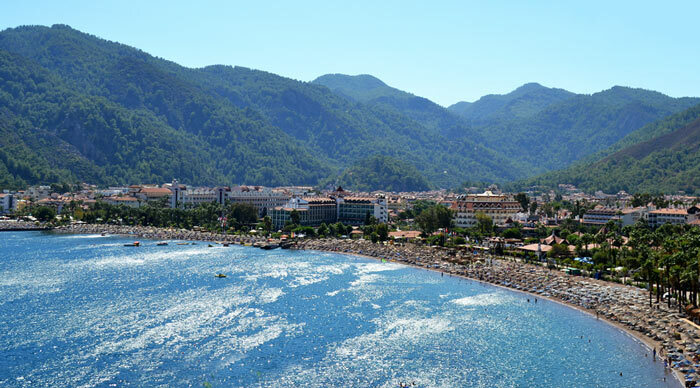 Icmeler — attractive beach town of the same name, is located near the popular resort of Marmaris, just an hour’s walking distance. It is selected for the rest couples with small children, the elderly. The resort is valued for its healing air, plenty of sources where you can not only relax, but also healthier as a family. Sea water is crystal clear, transparent, it has a turquoise hue. The beach itself is covered with sand and pebbles. Usually come here to rest, those who most appreciate comfort and high service. The beach is surrounded on three sides by mountains covered with shoots of trees. Another feature of the beach is that the sea can be reached on the island of Rhodes (total 50 km). Every day, several times a day a ferry goes there.